I am getting in the Halloween spirit. I love Halloween because it’s a chance to make things, and of course eat candy. This year I bought the kids costumes because I just couldn’t make them for what you can buy them for. I usually make my costume to match theirs, last year they were monkey’s and I was a zoo keeper. One year Sasha and I both dressed as the Cat in the Hat, and another year I was the Woman in the yellow hat with Curious Sasha. So this year they are both going as dogs, I was thinking that I would be a dog walker, or a vet, but my husband has suggested that I dress as a fox. 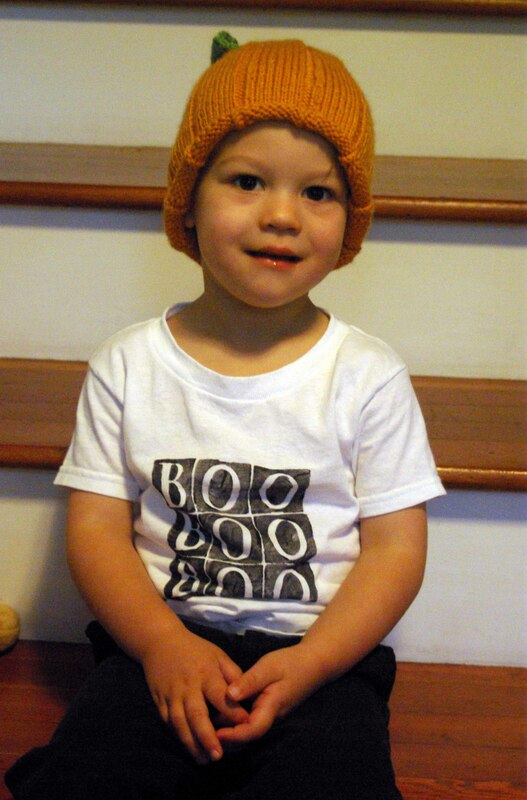 I made these shirts for the kiddies last night and thought that I would share a pic of a very happy little boy sporting his new BOO shirt and of course his festive pumpkin hat.